Food comes on a standard three-tiered tray, start from the bottom and eat your way to the top. As each new pot of tea arrives, take a moment to admire the color and fragrance of the tea before drinking. The pleasure of tea drinking, according to Cha Ching, derives from color, fragrance and flavor. 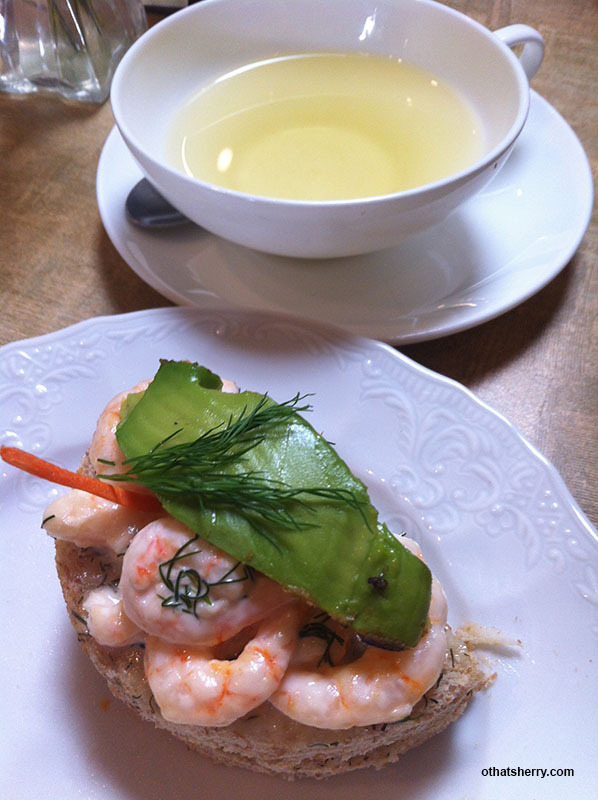 Sencha, which hints seaweed-y taste, pairs well with seafoods. The first tea is Oolong. Its oxidation lies somewhere between black tea, which is more oxidized, and green tea, which is less oxidized. As a result, Oolong has the delicate fragrance of green tea as well as the rich, full-bodied flavor of black tea. In addition, Oolong is also highly malleable; its taste ranges from sweet and fruity to woody and roasted to fresh and green. Pair the ‘greener’ tasting Oolong with seafood or sweets, and as for the heavier tasting Oolong, consider grilled duck meat. The Formosa Oolong, which is golden-colored with a fruity aroma (less oxidized), match well with the vegetarian spring roll. Next, I move on to Darjeeling tea (first flush) and chicken apple sandwich. Darjeeling tea, also known as the “champagne” of teas, originates from the famous Darjeeling region in India. It is roughly divided into two categories, first and second flush. First flush teas are harvested in spring whereas second flush teas are harvested in summer. In comparison, first flush tea, younger and more delicate, yields a light tea with an intense muscatel flavor. I love this Darjeeling tea, it is absolutely beautiful! Each sip blossoms on my palate and I feel as if I were tasting sunshine and flowers. 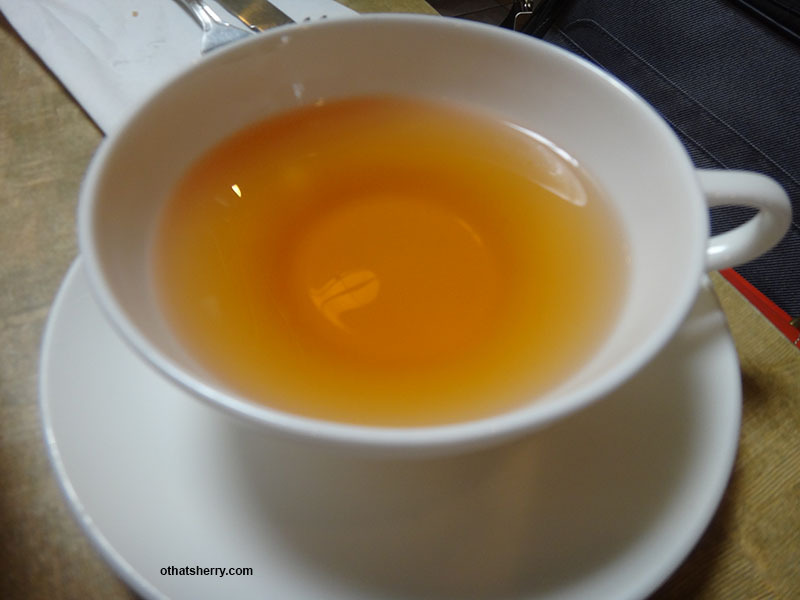 As I continue to sample tea after tea, I was pleasantly surprised by the experience. Indeed, with the right combination of tea and food, each brings out the best of the other. For example, at first I didn’t like Sencha because it smelled and tasted like seaweed. Gross, right? However, when paired with the shrimp salad sandwich, the ‘seaweed-y’ taste disappears completely and is replaced by crisp freshness. With so many teas and foods out there, the possibilities of creative, delicious pairing combinations are endless. Let your palate be your guide and start drinking! Quaint. Bring your laptop, grab a cup of tea, and work the afternoon away. Original Chinese review was published in News for Chinese (DEC 15, 2012).